This quote is dear to my heart. My husband, Jessie, and I are huge fans of Disney’s movie "Up". He is my Carl and I am his Ellie. Living in a one-bedroom apartment, myself in Graduate school (paying my own way) while working two jobs, and Jessie recently graduated looking for a new job, we were saving every penny we had for our future as husband and wife. We wanted a honeymoon filled with many memories and adventures as husband and wife, but our cash was very limited. Jessie and I decided to go to a place neither one of us had been before and would stay within our budget and the means of Traveler’s Joy gifts. Adventure was out there and we found it at Niagara Falls! Due to time restraints for graduate school and Jessie starting a new job, we could only squeeze in a three-day and two-night trip for our honeymoon. We were married September 25, 2011 and we planned our honeymoon from September 27-29. While thinking about a place to go as husband and wife, we wanted to go somewhere that we felt we could see and experience fully within our short amount of time. We first thought about Las Vegas, but later jokingly I mentioned Niagara Falls because it is the No. 1 spot for honeymooners. Jessie agreed on the destination and we decided on the falls because it was a spectacular tourist site that can be experienced to its fullest in three days. Through family and friends, our registry reached about $800 and out of pocket we spent an extra $400. In total, we spent about $1,200, which included accommodations, airfare, rental car, and food/attractions. It was the best vacation for the price! Two days after our wedding, we were picked up early in the morning by a family friend’s town car. The car bobbed and weaved through the morning traffic down to the airport. We sat comfortably as husband and wife talking about the wedding and the exciting adventure just a couple hours away by plane. We bid adieu to our friendly driver and checked into the airline counter. After trudging through airport security with my beautiful sunflower bouquet in one hand and my overnight suitcase in the other, Jessie and I sat down for a delightful breakfast at the Fridays in the airport. People wished us much happiness over our scrambled eggs and bacon before we toasted to our trip with orange juice and patiently waited for our flight to be called. We boarded the plane with our carry-ons and the bouquet. Jessie and I longingly stood in the aisles looking for our cramped seats in coach. We waited in anticipation for the aircraft to close, when all of a sudden the overhead speaker came on and made an announcement. The flight attendant approached us with a smile and led us to first class seating. We were so excited and surprised of the hospitality the airline gave us as husband and wife. We comfortably spread out our legs and watched the clouds go by through our little window. After a couple drinks and a smooth journey, we arrived to the Buffalo Airport. After signing the car rental policies and finding attraction maps, we were off on our adventure. It was a grey and cloudy Tuesday morning, but we didn’t mind because we were ready to go. 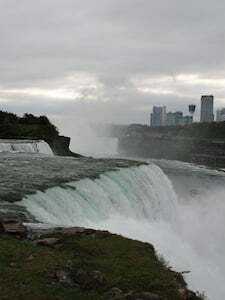 The trip took 45 minutes from Buffalo to the USA side of Niagara Falls. Jessie and I excitedly parked the car in a nearby lot and walked around the city. We found all kinds of great touristy shops and attractions that were inexpensive and entertaining. First, we headed to the Seneca Hotel and Casino for lunch. Walking through the aisles of slot machines and down the path of neon signs, we found a great “Build your own Burger” restaurant. The burgers were massive! The shakes were thick! The fries were crispy! Our stomachs were in paradise. We sat watching the slots get cranked over and over again while eating our delicious lunch and planning our afternoon. Later, we decided to check out the Adventurist Museum. It was a great little exhibit in the nearby general store. It was about all the people who performed stunts around the falls. It was very interesting and it was free! In the shop, Ttey had the different types of barrels people created to travel over the falls and many artifacts from the different experiences from the falls. I thought it was neat to see firsthand some of the local history from the falls. 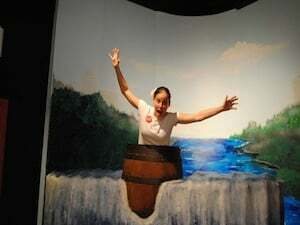 I learned from the museum that it is supposedly illegal to go over the falls in a barrel. If one survives, they have to pay a hefty fine. Next, we wandered to the wax museum across the street. For $8 a person, we learned more about the falls history and a few random facts as well. They had some great hokey 1950s-era wax exhibits about the Indians, the battles, and different historical figures who have visited the falls. We also saw some wax exhibits that had nothing to do with the area like Julia Roberts and Princess Dianna. (I don’t know why they were there, but it was entertaining.) I enjoyed the wax museum because we learned more about the area and was entertained for very little money. We ended our trip on the American side with a falls visit. We saw the falls from the American side while overlooking the Canadian side. How those people went over in a barrel and survived, I have no idea! The falls were beautiful. They were very spectacular and awesome. It is difficult to put the sight into words but we were so glad we decided to take this trip. 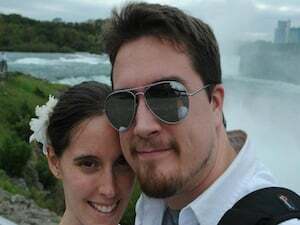 The rest of our honeymoon was spent on the Canadian side of the falls. We resided at the Hilton and it was amazing. 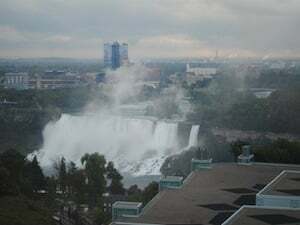 We deiced to stay at the Hilton because of its great rates and from people saying that the falls are better experienced from the Canadian side. The Hilton is apparently cheaper than the Seneca and it has great views of the city from the rooms. Because we had a honeymoon in the middle of the week, the concierge bumped up our city view room to a suite overlooking the falls. The view was so wonderful! We sat on our little couch overlooking the falls and absorbed the experience before dinner. We watched the comings and goings of people and saw the sun go down. Later, we went to a restaurant across the street and overlooked the brightly lit Horseshoe Bend falls over dinner. The restaurant was quiet and we enjoyed our dinner by the rushing water. The next day, we decided to see more of the Canadian side away from the falls. We enjoyed the falls and all its glory, but we wanted to see a little bit more of Canada before we left. (Jessie and I have never been.) After breakfast in bed, we headed to Niagara-on-the-Lake. Our trip held many stops along the way including enjoying some of the winery country side along the parkway. Throughout the day, we experienced the Horticulture clock (biggest clock made from flowers), the Canadian monument, the country stores, and picturesque moments. While in town, we quickly discovered it was filled with much character. They had great stores filled with knick knacks, antiques, and local art galleries. They also had some mom and pop restaurants, ice cream parlors, and coffee shops. Since it was another cold and dreary day, Jessie and I ate lunch at the local sandwich shop. They had great homemade soup and sandwiches for reasonable prices. We sat and enjoyed our lunch while watching the people walk by. Some people were in a hurry and others were tourists just like us. Before heading back to the hotel, we discovered a regional drink called ice wine. Apparently, Ontario is the biggest distributer of ice wine. We decided to buy a couple single servings to experience the regional drink. We packed up the car and headed back to the hotel with the curiosity the bottles held. When we got back to the room, we cracked open the bottles and tasted the delicacy. Ice wine is a type of wine that is picked and squeezed in the middle of winter. The wine is thicker than usual and also sweeter. I thought it was great! I was a little bummed we didn’t get more, but at $30 for two single servings, we were satisfied with the tasting. The next morning, Jessie and I packed up our belongings and made the trip back to America. On the way out, we decided to experience the Maid of the Mist. We felt like we couldn’t leave Niagara Falls without experiencing this. We boarded the little tug boat with our blue ponchos and stood at the front eagerly waiting on the ride. As the boat approached closer and closer to the falls, the mist got stronger and stronger and the breeze began to blow. I thought it was great to see the falls all around me. So much water falling over the rocks at once! It was beautiful and breathtaking. We were both glad that we waited for the last day to go on the Maid of the Mist. It was a perfect ending to the best honeymoon. I would recommend this destination for a honeymoon because there are so many variables to experience at Niagara Falls that each couple can make it their own with their own budget demands. With our small budget and shortened time, we felt like Niagara Falls was a great place to start as husband and wife. It was budget friendly, close to home, and spectacular. We couldn’t have asked for a better adventure.